The above image summarize the difference between container and VM, yet they can be combined and docker can be nested inside VM. We will pick Docker to give high level functionality of it here. Docker began as an internal project for the dotCloud organization. It was developed in-house and then later open sourced in 2013. Separate your applications from your infrastructure so you can deliver software quickly. 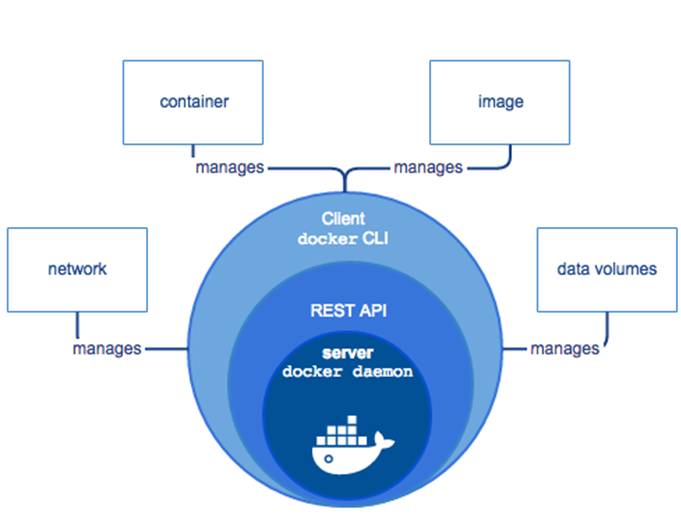 As we can see Docker composed of Server (docker daemon) which expose the docker functionality via REST APIs, the docker command line client uses these REST APIs to communicate with the daemon service/server. The main components as we can see is the Images, Containers, Network and data Volumes. We can add to them the registries. An image is a read-only template with instructions “Dockerfile” for creating a Docker container. Often, an image is based on another image, with some additional customization. You might create your own images or use those created and published by others in a registry. When you change the Dockerfile and rebuild the image, only those layers which have changed are rebuilt. This is part of what makes images so lightweight, small, and fast, when compared to other virtualization technologies. It is composed of 3 main parts, base image for that docker, different docker building steps including our application, finally the start command of that docker. 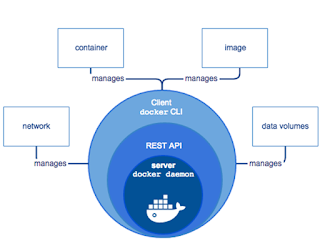 You should know that docker image is layered and Any RUN commands you specify in the Dockerfile creates a new layer for the container, this allow us to share the layers and build upon them which improve the usability of the containers and their layers. A Docker registry stores Docker images. Docker Hub and Docker Cloud are public registries that anyone can use, and Docker is configured to look for images on Docker Hub by default. A free https://cloud.docker.com/ account can be created where you can use it to store your docker images. You can use: docker search keyword to search for any docker image. e.g. 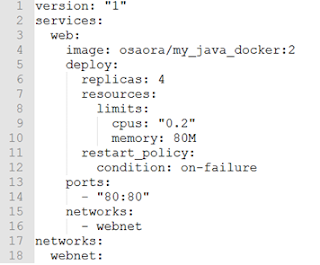 docker search oracle ==> to search for Oracle images. A container is a runnable instance of an image. Capture a new image based on its current state. Bridge (default) : limited to a single host running Docker Engine. Overlay network : supports multiple hosts. To add a docker into a network: docker run -d --net=my_bridge …..
Used to persist data, independent of the container’s lifecycle. Note: Shared storage can be used but need to pay attention to write operations to avoid data corruption. A swarm is a group of machines (physical or virtual) that are running Docker and have been joined into a cluster. Contains Swarm Manager and Worker Nodes. “global” : which ensures that each machine gets exactly one instance of the specified container. You execute: docker swarm init to convert this machine to Swarm Manager and then use: docker swarm join in other machines to join this cluster. A service only runs one image. Describing: what ports it should use, how many replicas, resources, etc. 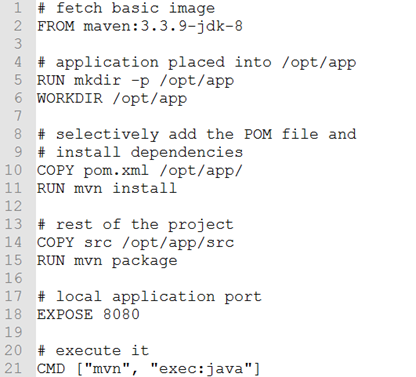 docker build -t my_java_docker . //Access the DB Docker using bash and execute the required DB scripts. 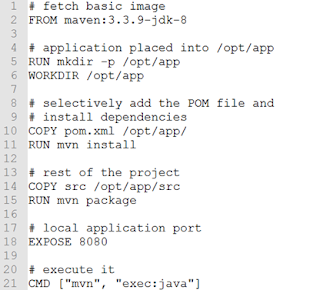 //run SQLPlus to create our DB objects ..
//Run the Java container using the DB IP address as Environment variable in the Java docker container so it can connect to the DB successfully. That's just an introduction about Docker and Container Technologies.